I Lost My Job Because of Organizational Downsizing! Now What? We received an e-mail from Christina who was one of a number of people let go in a corporate downsizing. She’s feeling a mix of emotions right now. She gave 100 percent to her employer and was identified in the community by her job. She’s having a hard time and wondered if we might be able to offer some tips to get through this. We’re so sorry to hear about your situation, Christina. It’s natural to feel a roller-coaster of emotions immediately after a dismissal. So how do you deal with it? Find a way to mentally escape for a bit. You’re going through a grieving process, Christina. Sounds strange, doesn’t it? But that’s what it is – you’re grieving the “death” of your job. We’re sure you can relate to some, or all, of these. It’s only natural. Allow yourself to be human and give yourself permission to ride this emotional roller-coaster. You may go through the stages sequentially, but it’s more likely that you’ll jump around. Let yourself go through it. Grieving is a process. You won’t be over this loss overnight so don’t set unrealistic expectations for yourself. Talk to people who care about you. And seek professional help if you think it will help. The good news is … you can replace your job! It may not be easy. It may not come quickly. But you can do it! So when you’re ready, start planning to move on. Picture yourself in your new job. Maybe you envision a career change. Or a business of your own. Develop a plan to get what you want. Perhaps you’ll need some more education. You may need to get some experience first. Your plan can factor in all of these things. You may still be grieving, but you’ll likely reach the acceptance stage faster if you focus on your future, instead of the past. Then do something about it. Try to do something every day that moves you toward your new life. Sometimes what seemed like a bad thing turns out to be a blessing. Many people have found their passion when they were forced to do so. Maybe you’ll be the next one! Our thoughts are with you, Christina. E-mail us anytime to let us know how you’re doing. If you have a suggestion for Christina, leave a Comment! Next time, we’ll talk give out 100 tips to succeed bigg. Until then, here’s to your bigg success! 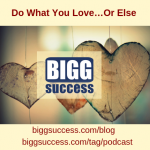 https://biggsuccess.com/wp-content/uploads/2015/07/BIGG-Success-Nurturing-Your-Inner-Entreprener.jpg 0 0 George Krueger & Mary-Lynn Foster https://biggsuccess.com/wp-content/uploads/2015/07/BIGG-Success-Nurturing-Your-Inner-Entreprener.jpg George Krueger & Mary-Lynn Foster2008-03-27 00:13:012015-06-14 15:23:23I Lost My Job Because of Organizational Downsizing! Now What? Thanks for answering my e-mail, and for lending a helping hand. You guys are great! I’ve said for a while that the only secure job in the US is the one you give yourself, or, more poetically, take up thy Rolodex and walk! Anachronistic, I know. A Rolodex is 1980’s speak for your list of contacts. The point, Christina, is horizontal loyalty. Make a list of all the people you worked with over the years, regardless of job title, where you liked them and they liked you. Your work friends. Go all the way back. Where are they now? Probably at some other company at some more responsible job. As people go through their careers now, they have more continuing connection with past co-workers than with any company. The idea of loyalty to a company – vertical loyalty – is daft, IMO. There are some rare exceptions like Starbucks and Whole Foods who are pretty solid. But most savvy workers take company promises with a grain or more of salt. Reconnect with everybody on your list, and you’ll have a job. Or, better than that, enough WORK that you won’t need a job. Great comment, Frymaster! Although, Fortune magazine would probably disagree at least 98 more times to the assertion that there only a few good companies for whom to work! You’re spot on – it is more important than ever to maintain your “Rolodex”. Fortunately, it’s also easier than ever with social networking. Thanks for a great addition to the post! I’m not sure that Fortune and I have the same definition of “good,” but point taken. What to expect when you unexpectedly lose your job…. Effective Communication Across Department Lines 100 Tips to Succeed Bigg!